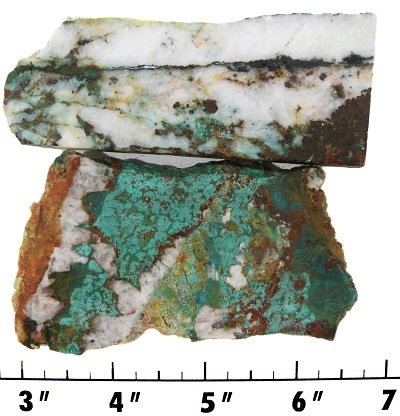 This material came from two pieces of rough that a Bisbee miner smuggled out in his lunchbox. 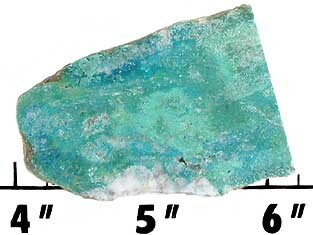 The base material is a clay-like limestone that was slowly infused with mineralized water laden with copper seconaries such as malachite, cuprite and azurite. The result is this amazing one-of-a-kind material. This material was a little porous, so we had it stabilized. to produce an even polish. 1 at 9/32 to 1/8" thick. 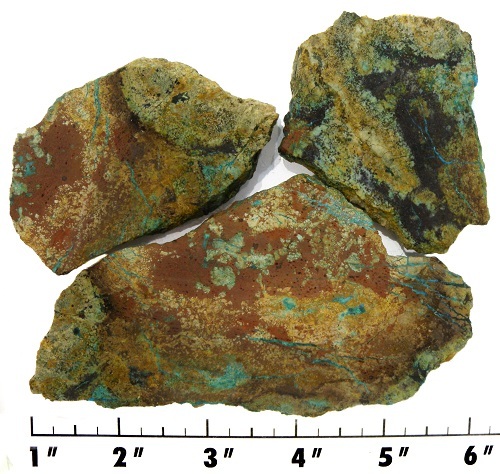 This Bisbee material has not been stabilized for porosity. 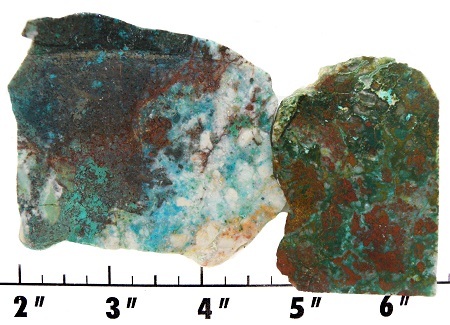 These secondary minerals formed from copper are relatively soft and need treatment before attempting to cut and polish them as they are brittle when left untreated. 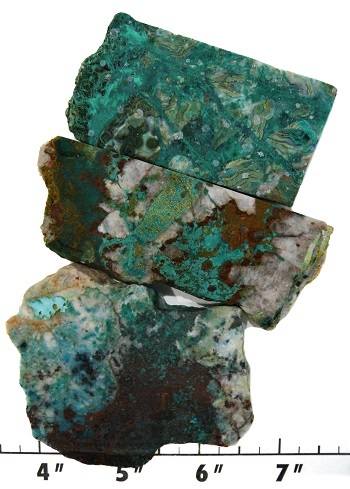 This material was brought to us as a sample by one of our turquoise suppliers. We loved it and ordered more. Sadly, he couldn't get any more of this awesome cutting material. It turned out that the few pieces he brought us were all there was to be had. 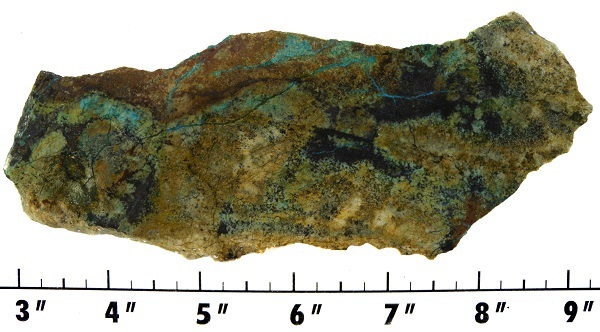 The barite in this material was infused with copper secondaries, most notably malachite and chrysocolla with some spots of cuprite. This material has fans of chatoyance caused by the cleavage plane of the barite. 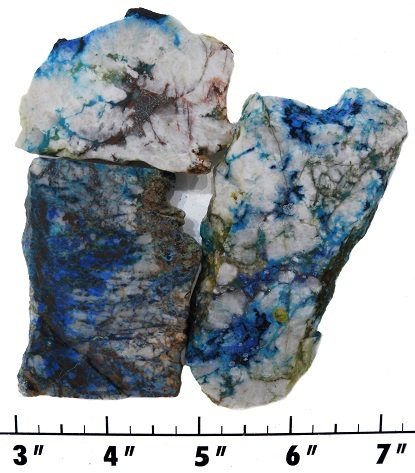 These are super rare, and beautiful one-of-a-kind slabs that will cut awesome stones. Cuprous Barite is sensitive to shock and should not be cut with coarse wheels. Although it may have a few small porous or vuggy areas, it should polish up nicely with tin oxide. An extra final polish with Zam (green rouge) will give it a better finlish. 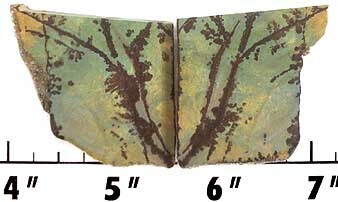 Measures approximately 5/32 to 3/16" thick.